Web Design and Online Marketing Tips by Craig Corbel, Vice President of Marketing at Solution Web Designs. All too often companies publish great blog posts assuming the traffic will naturally roll in. However, it requires a bit more effort to generate interest in your post and thereby increase traffic to your blog. 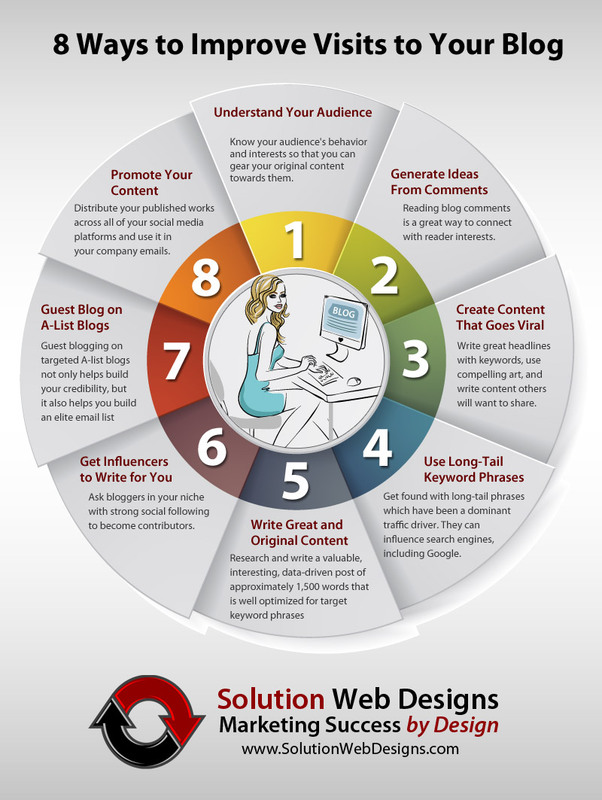 In fact, the following 8 tactics can help improve visits to your blog, so your efforts do not go wasted. And, they can be implemented yourself or via a reputable blog posting service. The first step to increasing visits to your blog is to know your audience's behavior so that you can gear your content towards them. To do so, just type your blog address into a search engine like Alexa, then scroll down to discover the level of engagement, which will be provided in three metrics: daily page views per visitor, bounce rate, and daily time on site. Using these three parameters, you can make the necessary adjustments to increase the level of engagement in your posts. Reading blog comments is a great way to connect with your readers, and it can also provide a lot of useful ideas. Find comments from knowledgeable people that can be used for future blog article topics. This can be done by skimming your own posts for useful comments, or you could also find them by visiting authoritative blogs, such as Moz Blog, that contain comments that provide expert advice. A site like Buzzsumo can also be used to help generate ideas. Simply key in your primary search engine keyword, and it will display the number of social media shares for the most popular posts surrounding your keyword, which can then be used to inspire social media engagement in your posts. To create viral content that increases traffic to your blog, look for the sites that consistently create successful viral posts. When researching these sites, you will typically find that some of the most successful tactics used include understanding their audience in addition to presenting intriguing ideas. They also will have a great headline. In fact, studies show most people will click to read your post simply by having a curiosity-driven headline alone. A site such as Ubersuggest is a great tool for finding related keywords and phrases you could use in your blog title to help generate interest. They also include short emotional videos, which is an excellent way to get readers involved with your blog post topic. They also tend to limit engagement. For instance, the more social media sharing buttons you have, the lower conversion rates tend to be. Therefore, many successful blogs tend to provide limited choices to drive engagement with a blog article and increase search traffic. Long-tail phrases have long been a dominant traffic driver. In fact, they influence most search engines, including Google, which drives organic traffic to your blog and can ultimately increase your traffic. To identify useful long-tail keywords, you need to research thoroughly and then create long, effective phrases with these keywords front and center. This not only helps bring traffic to your blog but also builds a strong community around your ideas. Long-tail keywords teach you various things, including searchers intent and what they are searching for, which can then be used to structure your content so that it can address the searchers issue. Google Autoset and Google Keyword Planner are also great tools for finding high ranking phrases. Research and write a valuable, interesting, data-driven post of approximately 1,500 words that is well optimized for target keyword phrases, and be sure to include plenty of images, data, and links to authority sites in the niche. If you are limited with free time, a blog posting service can assist with this. There are no shortcuts, everything you write must be original. Getting key influencers to write for your blog is an excellent way to increase your traffic. To do so, reach out to the bloggers in your niche who have the ability to write continuously good content and have a strong social following. Ask them to become contributors. By getting influencers involved, you will not only be building a relationship and getting great content for your blog, which will hopefully lead to more shares and links. You will also be increasing your access to high-quality distribution channels by way of the influencer's social network. They may also be able to link to content they have written for your blog via a third party site down the road. Guest blogging on targeted A-list blogs not only helps build your credibility, but it also helps you build an elite email list. To grow your list, select a list of active authority blogs with a lot of social media followers who may want to learn about the subject of your blogs. To locate authoritative blogs in your niche, simply go to Google and key in phrases like "your primary keyword + submit guest post" etc. that will give you a list of target places to guest blog and also provide search traffic to your site for your email list. Once you publish something on your blog, distribute it across all of your social media platforms, but don't stop there. Share posts multiple times on a regular schedule, perhaps about once a week. Be sure to send your posts via email to your friends and business associates. In the end, each of these traffic driving methods are effective; however, you have to stick to the plan to realize results. Do so, and you will increase visitors to your blog, gain email subscribers, generate traffic to your website, and boost your conversion rate. For many businesses finding the time to post consistently can be daunting; therefore, you may consider enlisting the aid of a reputable blog posting agency which is well adept in these, and other, traffic driving tactics, so you are free to focus on other tasks. Craig Corbel is the Vice President of Marketing at Solution Web Designs, a full service, web design, and online marketing agency. Learn more by visiting their website. 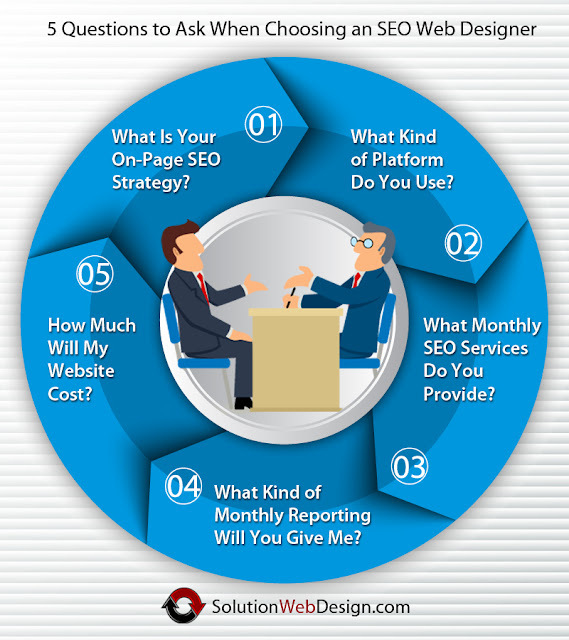 There is a huge difference between a web designer and an SEO web designer. Choosing the right design team for your business is critical if you want to generate qualified leads for your business. A web designer will make a pretty website. If you are a model who is building a portfolio website, you may not need SEO. Your name will be the only keyword required to find you and the search engines are smart enough to figure that out with proper SEO installed on the website. However, this is not a sound strategy for a business website that should generate customers and have a financial return on your investment. 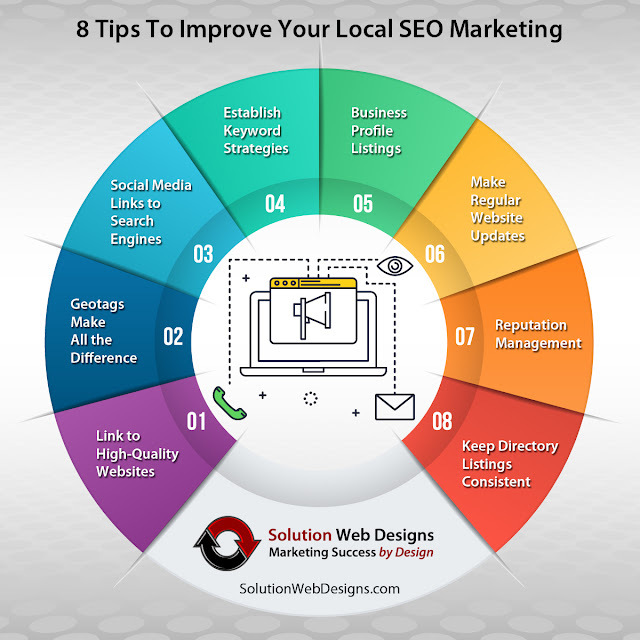 Building your brand involves using local SEO services like site optimization, directory assistance, and regular content creation. Keyword optimization and ensuring your site has a strong frame with little to no bugs or issues are vital to retaining visitors to your website. People will not stay on the site long enough if you use old content or big blocks of text with large words that no one understands. Use internal links to your web pages to build your ratings, says Forbes. The sites you link with help determine the search rating you get online. Adding connections to reputable websites and enterprises boosts your reputation. The goal is to find your business on pages like Yelp and Google. You know you are successful at SEO when you find out you have a wiki link says Inc.